This type of planning ensures that the business continues to operate efficiently without the presence of people who were holding key positions in their organizations. During this interactive session, participants will learn the elements of succession planning, common pitfalls to avoid, and will leave with ideas to try in order to increase the likelihood that there will be success as a result of meaningful succession planning in their organizations. A fee of $10 includes light breakfast fare. In this session, participants will learn about Don Miguel Ruiz’s philosophy and book, “The Four Agreements” and how, if adopted and practiced, personal freedom and happiness can increase while personal suffering can be reduced! 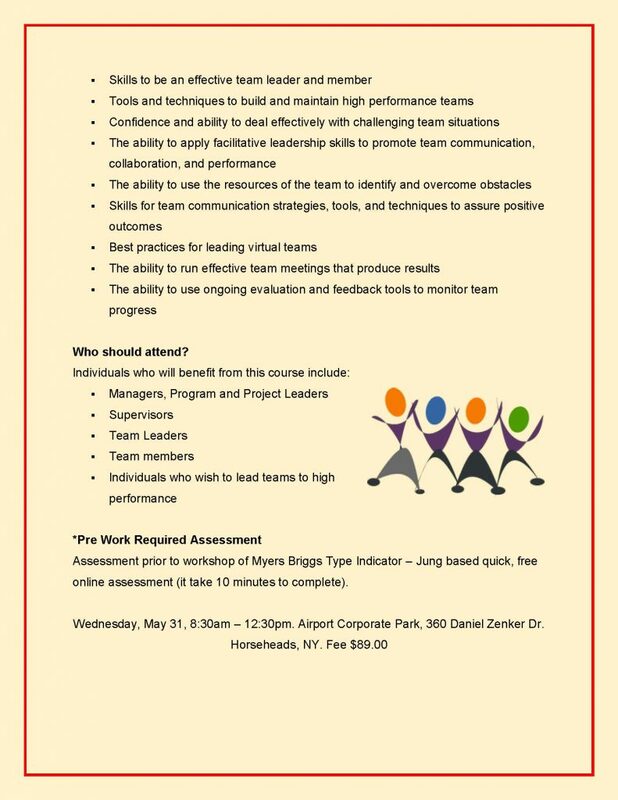 Join this active session for an overview and ideas on how to best leverage these agreements beyond the session. Collaboration and Inclusion: There is Strength in Unity!! Everyone has something to contribute – especially for problem solving and projects! In this session elements of difference are discussed and how aspects of life shape our unique perspectives. The goal is for participants to develop appreciation for others’ unique qualities and how to leverage them for great results through collaboration. Collaboration and Inclusion: There is Strength in Unity! 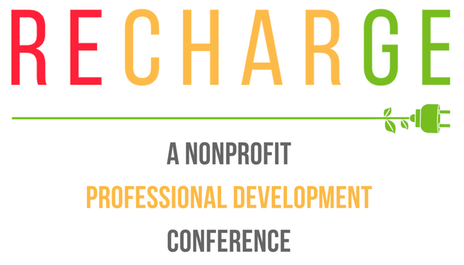 Join me on November 1, 2017 at the Hilton Garden Inn Pittsburgh/Southpointe for a full day of learning designed to help project managers be more effective and successful. Graduate Diversity & Inclusion Welcome Reception! All interested community members are invited to attend this event to network with new and continuing graduate and professional students, staff, faculty, and other community members to celebrate and develop connections. 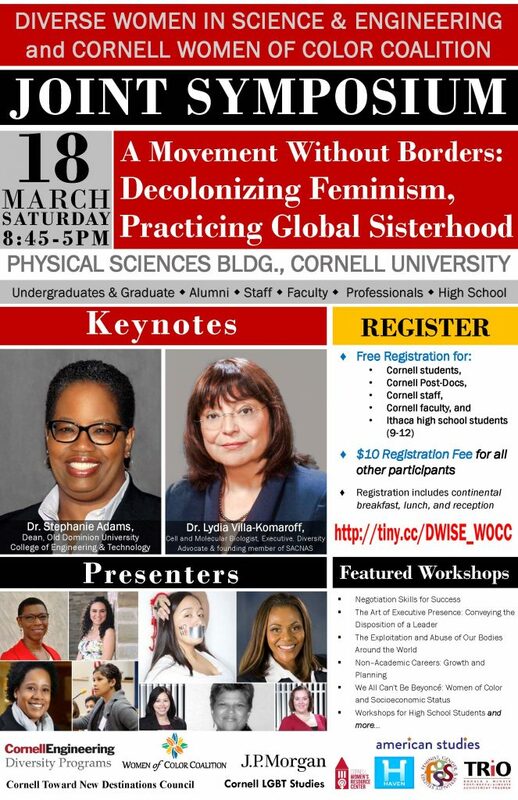 This event will highlight several graduate and professional student organizations focused on diversity and inclusion and will feature Cornell alumni speaker, Judith Rowe. *Please note that we would not want childcare to prevent anyone from participating in this event. Therefore, if you have children and wish to do so, we welcome you to bring your children with you to this family friendly event. Empower Yourself for Customer Interactions! Sometimes no matter what you do, you simply cannot satisfy a customer. Learn how to turn these negative situations around to your best ability. Learn tactics for dealing effectively with even the most difficult patrons. Equally important is knowing how to recover quickly from verbal attacks and difficult customers. Learn some techniques for how to clear your mind, put the negative behind you, and return to service. This is a Corning Area Chamber of Commerce and Corning Community College (SUNY) sponsored program. Everyone has something to contribute – especially when it comes to problem solving, projects and innovation. When leaders choose to leverage the best each person has to offer, everyone wins at work! In this session, Judy will share the elements of diversity as the basis for understanding that each person has a unique perspective that is shaped by these elements. The goal is for participants to leave the session with ways to effectively include others to gain the best results from collaboration, and an appreciation for others’ unique qualities and concepts. Register before Sunday, Mar 19, 2017 to avoid late fees. In this interactive session participants will learn the elements of succession planning and some common “pitfalls” to avoid. Participants will leave with ideas to try in order to increase the likelihood that there will “success” as a result of great succession planning in their organizations! 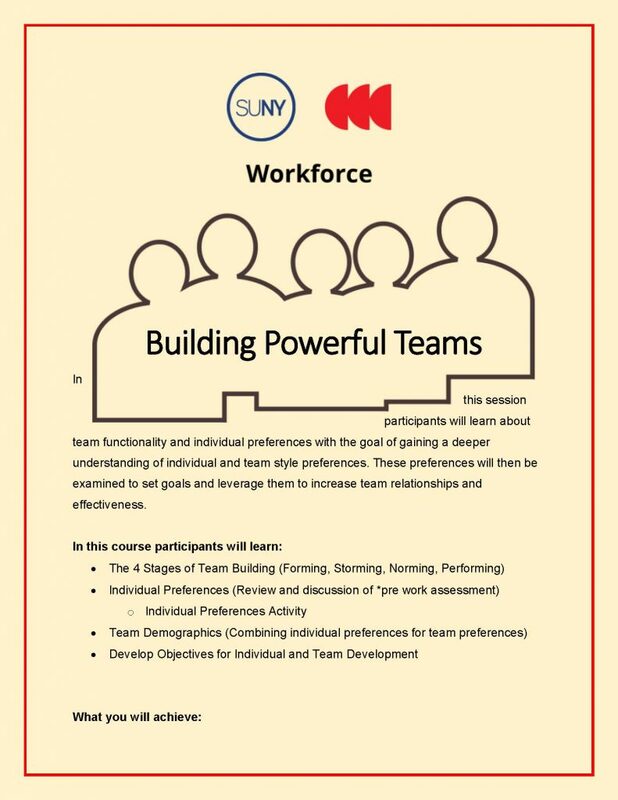 In this session participants will learn about team functionality and individual preferences with the goal of gaining a deeper understanding of individual and team style preferences. These preferences will then be examined to set goals and leverage them to increase team relationships and effectiveness.